Defragmenting your PCs hard drive is an essential chore in order to keep your PC in tip top condition. However, it is amazing how many users simple ignore this essential and important piece of housekeeping. Of course Windows already has its own defragmentation software, the only problem with this is that you either have to manually defragment your hard drive or else set up a scheduled task to do it for you. Wouldn’t it be nice for once if you could just install a defragmentation application and have it complete the task of defragmenting your hard drive without you have to remember to manually do so, or mess around creating a scheduled time for it to begin? Well now you can with Diskeeper 2009. For the Home/Home Office market Diskeeper 2009 comes in four versions: Diskeeper Home; Professional; Pro Premier and Home Server. For the purpose of this review we shall be looking at Diskeeper Pro Premier. Diskeeper 2009 doesn’t only intelligently defragment your hard drive, but it looks good too. The Diskeepr Console is pleasant to look at and displays a host of important information about your hard drive(s). Common commands are logically grouped together and the tabbed panes show the condition of your hard disk(s), the most recently defragmented files and, most importantly, the health state of your disk. A simple click on the ‘recommendation’ button at the bottom of the Diskeeper window can also give you valuable suggestions for improving or maintaining your disks. Diskeeper 2009 is currently the only defragmentation application that will defragment your hard drive in ‘real time.’ There is, therefore, no need for scheduling or manual defragmenting. Just install the software and forget it, Diskeeper will do the rest; it truely is a ‘set it and forget it’ application. 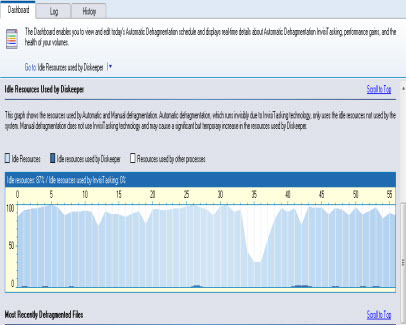 Diskeeper 2009’s InvisiTasking technology automatically handles performance robbing fragmentation as it occurs. Because your disk(s) are defragmented in real time you can continue working knowing that Diskeeper will only continue when idle resources become available. This ensures that no resource conflicts occur while the defragmentation task is being performed. As well as InvisiTasking technology, Diskeeper 2009 boasts I-FAAST (Intelligent File Access Acceleration Sequencing Technology and Frag Shield. I-FAAST improves file access/creation by a typical average of 10% - 20%. Frag Shield, on the other hand, helps prevent fragmentation of all your critical system files, thus helping prevent MFT (Master File Table) and Page file fragmentation. Just like InvisiTasking, Frag Shield works in the background. 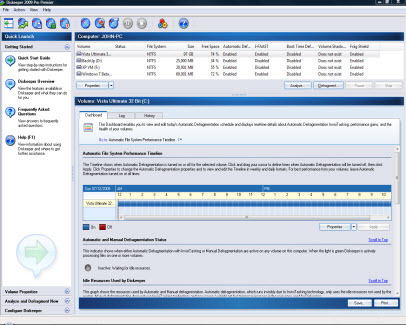 With most defragmentation applications you require a minimum of 10% free space available on your hard drive to be able to defragment the hard drive successfully. 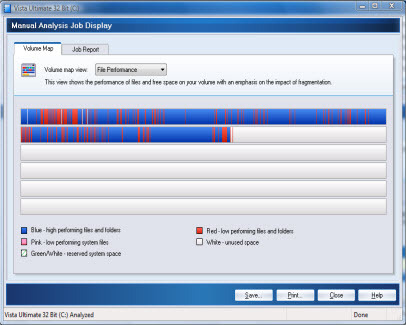 Without this magical 10% margin most defragmentation application will not process the defragment command. Diskeeper, on the other hand, gives you much more leeway requiring as little as 1% free space in order to complete its task successfully. Modern high end computers contain large hard drives, therefore they require a high power defragmentation engine. Diskeeper’s Terabyte Volume Engine (TVE) has the advanced technology necessary to defrag these large volumes. This type of technology is a must for users manipulating large databases and CAD programs. In our test Diskeeper Pro Premier performed exceedingly well. With the defragmentation going on in the background you only became aware that Diskeeper is doing its job when you hear the hard drive ‘chattering’ away. Multitasking during a defragmentation cycle didn’t seem to be affected adversely. We did see a slight slow down while access online website files from our own website, particularly when saving new web pages, but one can’t say for certain that Diskeeper was the cause. Diskeeper Pro Premier has been designed for high end systems and power users and it certainly doesn’t disappoint. And as we have, for many years, been an avid Raxco PerfectDisk user that is a hard statement to make. But give credit where it’s due Diskeeper certainly made an impression with us and we can highly recommend it!